Vulnerabilities among populations prone to natural disasters are visualized with GIS. GIS is used extensively in the prevention step of the disaster cycle. ArcGIS helps forecast the impact of imminent natural disasters. The World Food Programme (WFP) is the food assistance branch of the United Nations (UN). George McGovern, first director of the US Food for Peace Program, proposed the creation of WFP to the UN’s Food and Agriculture Organization (FAO) in 1961. WFP was formally established in 1963 by FAO and the United Nations General Assembly. 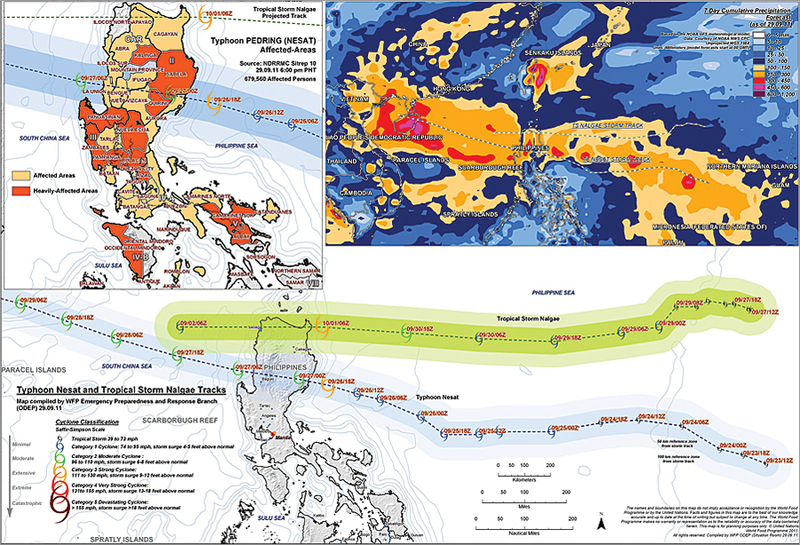 Typhoon and tropical storm tracking in the Philippines: The World Food Programme (WFP) uses ArcGIS to understand vulnerabilities among populations living in areas prone to natural disasters. Here the evolution of Hurricane Nesat and Tropical Storm Nalgae are shown in relation to affected areas along their tracks. Today, WFP is the world’s largest humanitarian organization fighting hunger worldwide. Its primary mission is providing food to those who are unable to obtain it for themselves. On average, WFP delivers food to more than 90 million people per year, 58 million of whom are children. In addition to food security, WFP works to reduce child mortality, improve maternal health, and combat disease. The organization’s Operation Department of Emergency Preparedness (ODEP) actively supports various emergency relief efforts around the world with GIS analysis. To facilitate this work, it has developed a methodology using GIS to understand the higher vulnerabilities among populations living in areas prone to natural disasters. This analysis considers factors such as environmental degradation, food insecurity, malnutrition, and the historical occurrences of natural hazards. Satellite images are analyzed to identify poor growing seasons and years of low crop productions. The analyses help WFP quickly develop intervention strategies when disaster strikes. In addition to data acquired from the host country and the data it collects, WFP obtains regular updates regarding seasonal food insecurity conditions throughout the world from the US Agency for International Development (USAID) Famine Early Warning Systems Network. USAID analyzes the data it receives from US agencies, including the National Oceanic and Atmospheric Administration, National Aeronautics and Space Administration, United States Geological Survey, and the United States Department of Agriculture, to produce its reports and forecasts, which it then provides to WFP and other relief agencies. 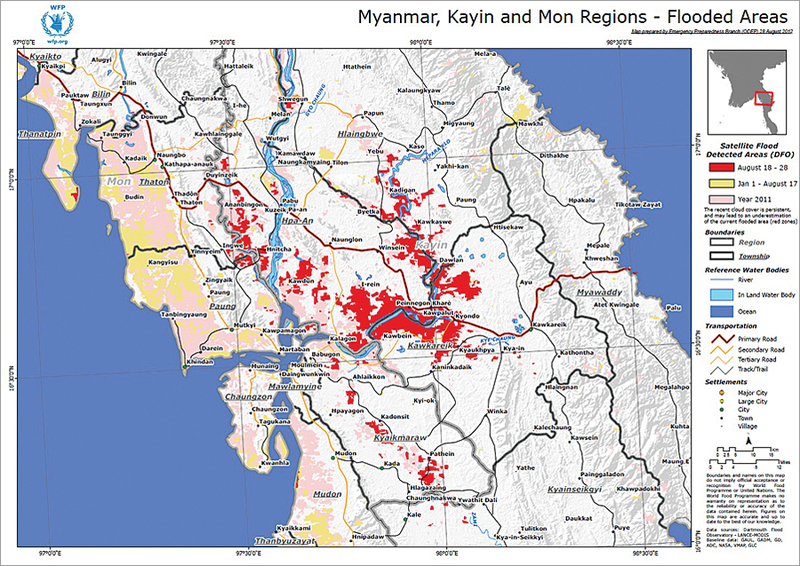 Satellite-detected flooded areas in the Kayin and Mon States of Myanmar (formerly Burma). According to Andrea Amparore, GIS analyst in ODEP, WFP is a longtime user of ArcGIS software, which plays a strategic role throughout the entire disaster cycle. The four recurrent steps in the disaster cycle are prevention, preparedness, response, and recovery. Because it is cyclic, there is no actual beginning or end. Preparedness includes risk identification and assessment; the development and maintenance of emergency communication services; stockpiling essential food supplies, water, and medicine; and the establishment of evacuation routes. “GIS is used here in the evaluation and categorization of potential risks, as well as determining the optimum locations for emergency food stockpiles, the development of evacuation plans, and determining the optimum routes for refugees if it becomes necessary for them to evacuate,” says Amparore. Response requires real-time monitoring for disaster relief efforts, such as resource allocation, the status of transportation routes, and the relocation of civilian populations. ArcGIS is used for forecasting the impact of imminent natural disasters, tracking human and livestock migration, monitoring the effectiveness of relief operations, and allocating resources. 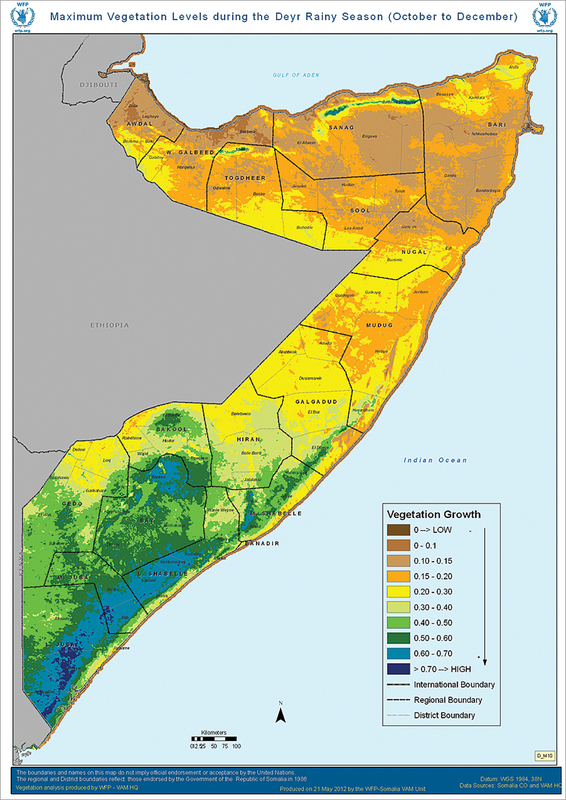 Maximum vegetation levels in Somalia during the Deyr rainy season from October through December. Because ArcGIS is used throughout WFP, the organization decided to implement an enterprise system based on ArcGIS for Server technology to better organize and manage its expanding geospatial databases. This has stimulated new projects in the agency and an evaluation by WFP of how GIS can be better used by its departments and partners. For example, WFP’s Vulnerability Analysis and Mapping unit recently created the Spatial Information Environment in an effort to increase access to original and derived spatial information within WFP and its partners. In addition, it is working with FAO to develop an ISO-standard metadata clearinghouse to enable greater compatibility and promote the sharing of spatial data between agencies. For more information, contact Jim Baumann, Esri.